The Cambridge Public School District’s Sustainability Plan outlines five main goals (below) that utilize the PFEWG™ model for sustainability in planning and implementation. PFEWG™, (pronounced f-yoog) was originally known as the “Greenfox5” and is a holistic approach to categorizing, integrating, and implementing sustainable systems without leaving out any elements of environmental optimization. The five categories of PFEWG™ include Products, Food, Energy, Waste, and Greenspace. Systems planning for sustainability in the design, operations, and practice within a community space requires an understanding of the big picture as well as the smallest of details. Sustainability is all about interconnectedness, but in order to plan a coherent system, system planners have to take into account the birds-eye view of a project, so that they don’t miss any large components. The categories of PFEWG™ allow for a simplified view of those large components that complete a sustainable system, and from there, planners can design and implement the small details that fill out the five categories, without missing anything in the process. Often there is overlap among the five categories, which demonstrates the nature of interconnectedness in sustainable systems. For example: the process of retrofitting lighting for an energy-efficiency project in a building falls under the category of “Energy” in the PFEWG™ model for sustainability. But lights are also “Products,” so a planner takes into consideration how to purchase lights that are environmentally-friendly in their inherent design and material brand. Another example is cafeteria “Food” where a planner asks questions related to sustainability such as “how far did the food travel to get here?” That question inherently relates to “Energy” because the planner has to consider how much carbon dioxide was used and what the carbon footprint was if the food wasn’t purchased locally. 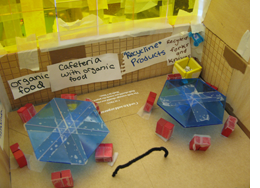 “Waste” connects to food as well, when a planner considers how to dispose of the cafeteria food in an environmentally-friendly way. In summary, the PFEWG™ model for sustainability has enabled us to design the Cambridge Public School District’s Sustainability Plan with goals, strategies, and action items that cover all the bases for environmentally-friendly options, providing a long-term roadmap for positive change.